Click the photo to view the PDF document. 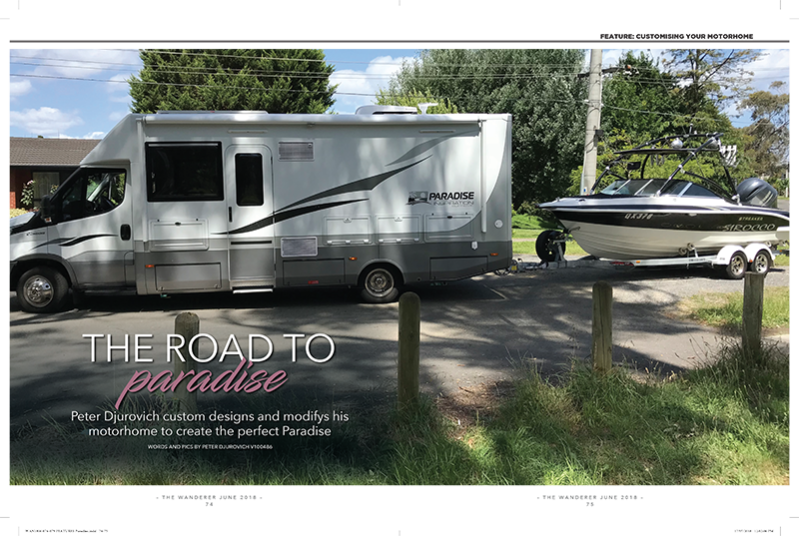 Browse through our very happy customer testimonials for our Paradise Motor Homes by holding the left mouse key down and dragging left or right over the testimonial or if you are on a mobile device simply swipe left and right on the testimonial. ask to have a look !!!! We only wish we’d come across Paradise years ago, and we’d have given caravanning away then. We can only hope there’s still a long road to be travelled. The shakedown solved the few minor issues we had. Thanks again, for your attention to detail and good service. All paramount for longevity of a successful business. Photo taken before crossing the creek, on our first off road trip. Will send more down the track. We are having a great time. Came over on the Princess and headed West from Devonport to Stanley then down the West coast to Strahan. Spent 2 days in Hobart, what a great place to get away from it all and meet lots of other happy folks enjoying this great country. The Oasis is a true dream to drive and the 4 WD has been real handy on the dirt. Another 2 weeks in Tas then back to Melbourne and the Great Ocean road before back home. We have just had our first Annual Service on our Paradise Inspiration motorhome. As well as a number of warranty items which required rectification, we had the full annual PMH service to ensure everything in the vehicle was top notch (check batteries and solar, cupboard hinges, water pumps and filter and so on). We also added a few more options, including heavy duty towbar and wiring harness, and the latest weatherproof Bluetooth awning speaker. And they even looked after arranging other things for us like dent removal, suspension adjustment by BIG Wheels, and the annual IVECO service. Picked up our new motor home 3 days ago. Have just travelled and 1000km and are very impressed with the quality of this MH. Great staff with a very easy buying experience being from a long distance away. Thanks Clint and the handover staff. Love the Paradise. Since May 2018 we have travelled over 10,000 kilometers in our Paradise Motor Home. Throughout Qld, NT, SA and Vic. Our Paradise Inspiration has been admired – whether in a freecamp on the Stuart Highway or a van park in Mt Isa. Truly a remarkable and well made motorhome which has more storage space than our old 22 ft caravan. The staff at PMH are happy to assist and answer questions, even if they are simple and sound silly. Thank you Paradise. Thank you Clint and Olly. Stew and Ann Ingles Canberra ACT. 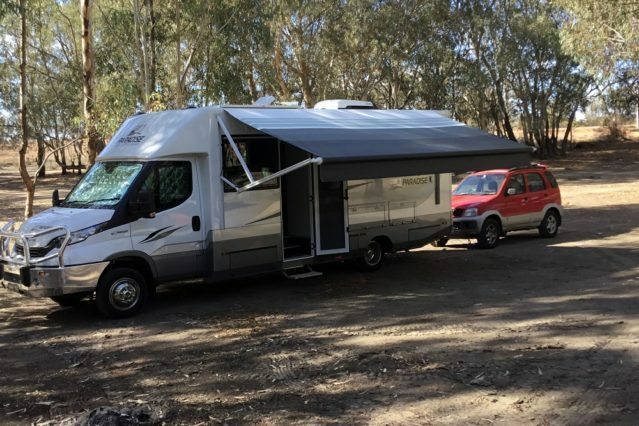 I just want to let you and your team know how pleased I am with my new motorhome, it has been a pleasure doing business with you from the first time I met you at the Melbourne caravan show to all the calls we had to get everything made to my specifications, nothing was a bother to you and everything was what I wanted. Susan and myself could tell that you were so proud of the quality and presentation of the motorhome when you presented it to us. The workmanship was first class and a credit to your staff. 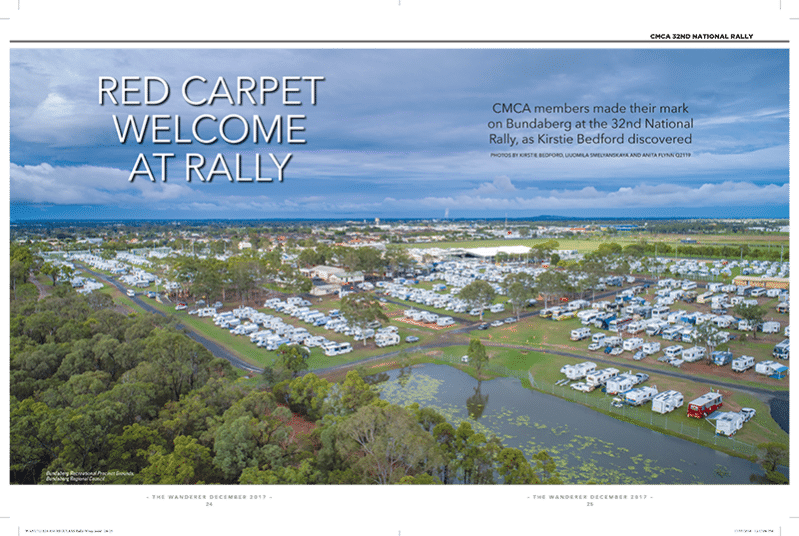 Hi Clint, I guess the biggest shock I got in July 2018 was, we walked into your yard as casual sightsee-ers and a few hours later we were being congratulated on the purchase of a new motorhome. We received a price to trade in our fifth wheeler and the payment plan was clear and achievable. From that moment on we had exciting anticipation. The thrill of choosing our own décor was made very easy by you and your employees. It all came together very quickly, with us receiving weekly build photos which kept up our level of excitement and anticipation! We arrived home on the 6th Nov 2018 the proud owners of a beautiful vehicle which used less fuel than the fifth wheeler going up , it was easier to park in its new home and it is still a joy to go outside and look at it. We are very happy with the whole experience we had with you Clint and your salesman Mark to help us achieve something we thought was unattainable. We certainly haven’t ceased to highly recommend Paradise Luxury motor homes to all we meet. 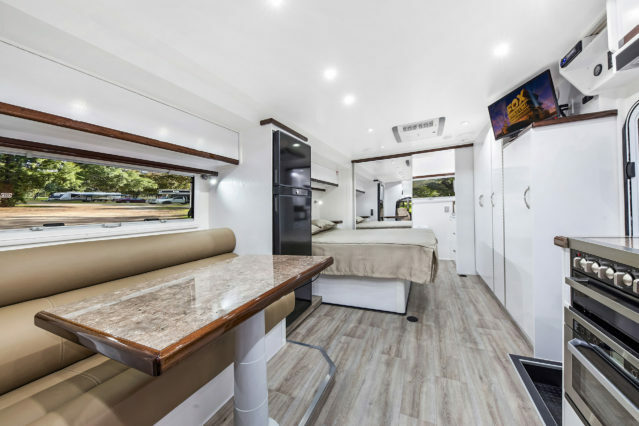 We have been inside various motorhomes as people invite us in for a look and we have always gone back to ours commenting between ourselves just how much more we like our design, colours , ease of use of the swivel seats, and overall satisfaction. Thank you for our Paradise Inspiration Supreme. We would like to sincerely thank the Team at Paradise for their assistance, guidance and production of a first class motorhome. In particular Mark Rixon was genuinely interested in our needs and guided us to the purchase stage and has continued to look after us. Since delivery, Clint and Oliver have always made themselves available to answer our questions. 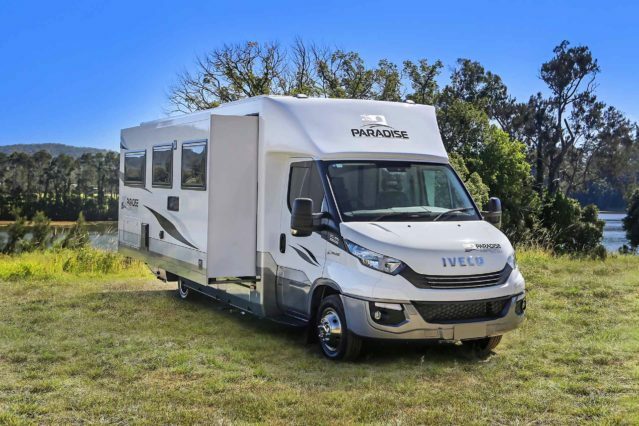 We would unreservedly recommend Paradise to anyone looking for a quality motorhome. Travelling around Australia is full of wonderful experiences, from the unique scenery to the wonderful people. Our camping, up until recently, was the old school tent and campfire in a diverse set of surroundings. From Caravan parks to remote “hike in hike out” sites. More recently, as our tolerance for blow up mattresses declined, the tent has gathered dust in the garage and we have stayed in Hotels. Then a few years ago we rented a motorhome and loved it. So we sat down and drew up a list of what we were looking for in a motorhome and hit the internet. At first glance the prices seemed a tad higher than we expected, but when considering what you get, it was worth it. After nearly 12 months of inspections, we came across Paradise on YouTube. What immediately caught our attention was the quality and craftsmanship; far above and unlike what we had seen. 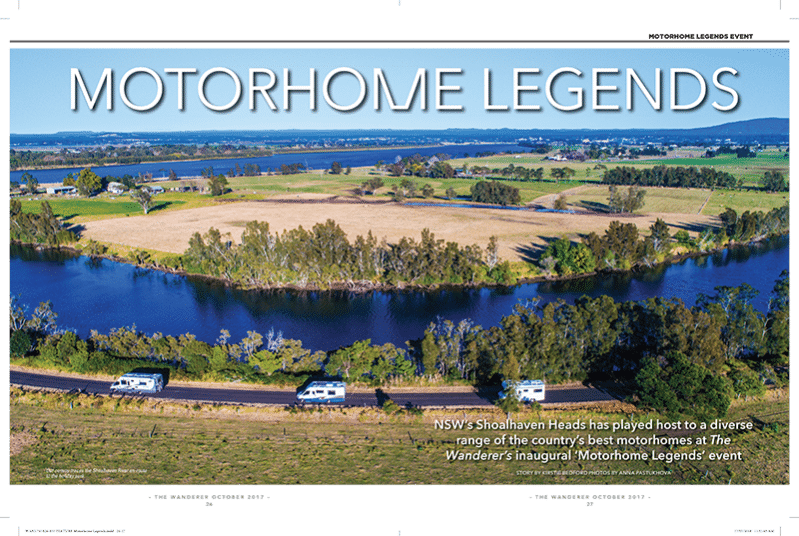 Getting a “hands on look” at two of the motorhomes was easy, even though there is no showroom in Sydney. Quick phone call had Mark arrive at our home, on route to a trade show, with two brand new units. Being a major purchase and our first motorhome we didn’t want to make any mistakes so fired off lots of questions via email and phone. Mark and the team were quick to respond with thorough and honest answers. With our busy work commitments Mark gave up a day on his weekend to meet with us at the Queensland showroom. We arrived with our list of needs and customisations and it wasn’t long before all were ticked off. The decision to purchase was easy. Customisations, with the other motorhome vendors was a limited to basic features, but with Paradise not a problem. For example we had a coffee machine delivered to them and they built it into the cupboards. Complete with slide out for servicing! Thank you it’s better than we expected. During the production we were delighted to receive weekly updates, complete with photos and every week we eagerly awaited their arrival. At key stages we were consulted on décor and finish to ensure the end product was what we wanted. 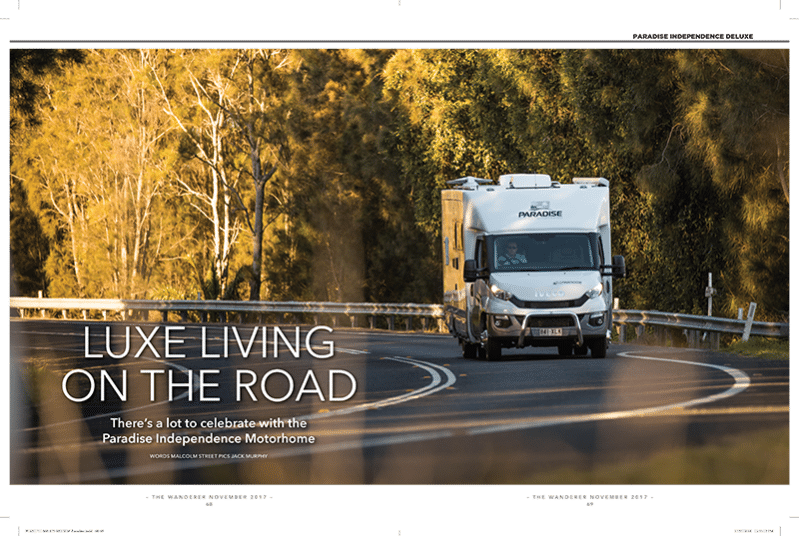 Being novice motorhome users there were things that we didn’t understand as being important for our needs. So during construction, we swapped many emails with the Paradise team. Big thank you to Clint for your assistance in changing the power storage to something more appropriate. Before we knew it the delivery date was upon us. It was pleasant experience, with a thorough inspection and technical briefing. Some of what we were told was immediately forgotten but the Paradise User Manual has been invaluable in our recent trips. Since we took delivery we have had very few problems, which comes as a big surprise. I had read blogs of other (NON Paradise) new motorhome purchases that didn’t go quite right. Paradise give you emergency contacts, so if you are in need of assistance someone is available, but we haven’t had the need! Again because we are new motorhome users there are some additions that we have had to make and Mark has set up phone meetings to lead us through the process. For example we needed to put in a Telstra Booster which required drilling into the roof to mount the aerial and feed the cable. After a very informative phone meeting and some detailed emails we were able to install the system. Without a leaking roof and the aerial is away from the satellite dish! We have now travelled over 6,000 kms on a few trips and it’s a pleasure to drive. Mileage is brilliant at 14 to 15 litres per 100km and that’s with a TOAD. I don’t know about others but a comfortable bed and good shower are probably the two most important features. Huge tick here with the shower better than what we have at home. The full sized queen island bed allows us to get in and out without disturbing the other. Not many others manufacturers offer this. Tip we had a custom mattress topper made which gives the extra comfort but stays firm. The fridge is a great size and will accommodate the longer trips. Plenty of cupboard space and the full length wardrobe allows for dresses to be hung without creases. Again something that the other manufacturers don’t seem to have. There is ample storage for kitchen items, food and beverages. Under bed storage is huge and we have been able to locate a laser printer and store two huge folding camp chairs, a BBQ, plus other stuff. Overall the fitout is of the highest quality. Leather seats and solid panelling complete with piano hinges and gas struts giving you confidence that nothing is going to come loose. Our Paradise Inspiration Supreme is Brilliant. It’s comfortable and allows us to stop, relax and enjoy life. Thanks to the entire team at Paradise.